February 2nd – The first of the springtime festivals, Imbolc is a festival of light and a celebration to welcome the first stirrings of spring and the lengthening of days. It is a cross quarter day halfway between the winter solstice and the spring equinox. The word Imbolc (pronounced im’-olk) is a Gaelic word that means “in the belly”. 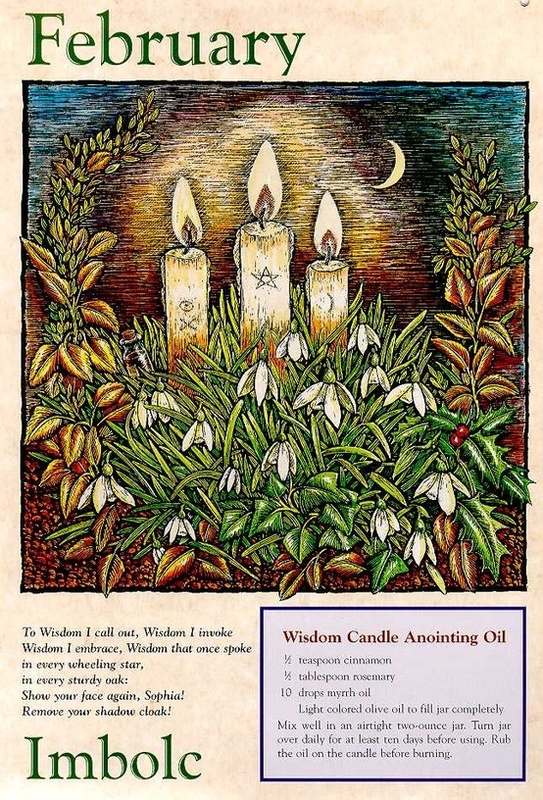 The theme of Imbolc is one of initiation, purification, and preparation. Just like the earth is pregnant with life energy unseen to the naked eye, Imbolc celebrates a time of becoming and the invisible process of manifestation. It is a period of inner awakening, and preparation for new life; a clearing away of the old to make way for the new, for what is to come, for the spring, and for what is yet to be born. In Neopaganism, Imbolc is the reawakening of the Earth Goddess by the Sun God’s increased energy. It is also the impregnation of the goddess by the god, and symbolizes the descent of spirit into matter. Decorations for Inbolc include a crown of candles, often lavender and white, corn dollies, seeds and the lighting of candles and fires. Historically, it is an Irish/Celtic/Gaelic festival dedicated to the goddess Brigid. It occurred around the time of year when the ewes would be lactating in preparation for the springtime birth of newborn lambs. In later times, it came to be associated with the Christian holiday of Candlemas, also known as the feast of the purification of the Virgin Mary. Candlemas is also associated with the Roman festival of Lupercalia, which was a festival of light held on February 15th. * make snowflakes and burn those, to say goodbye to the winter and welcome the spring. Have you heard of ‘Spring Cleaning’? Imbolc is a great time to consider personal ‘Spring Cleaning’. Take a personal inventory. What you have, and what you need. Make room for the new by removing the old. Take a moment to make note of how you spend your energy daily. Considering your daily activities you can now cross of that which depletes your energy, and focus on that which replenishes your energy.